With the resumption of Windows 10 builds to testers, Microsoft has told users they may not have the right to run the software and again begun marking copies with small watermarks. Microsoft released Windows 10 build 10525 to its Insiders preview participants Tuesday, restarting the early-look program after a four-week hiatus while it pushed the production code to users. During the pause, the watermark identifying the build as a preview was removed. The watermark has now returned for users who installed a Windows 10 preview. The watermark read, "Windows 10 Pro Insider Preview. Evaluation copy. Build 10525 [emphasis added]." More importantly, Microsoft has warned users that they may not be legal. 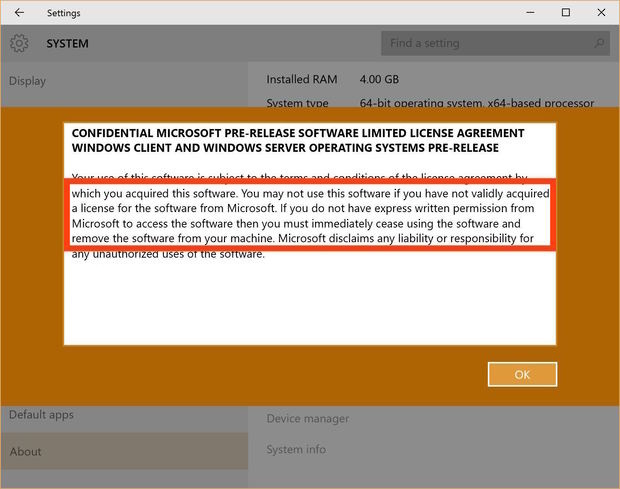 "You may not use this software if you have not validly acquired a license for the software from Microsoft," stated the text that appeared when users clicked on the link marked "Read the Microsoft Software License Terms" from Settings/System/About. "If you do not have express written permission from Microsoft to access the software then you must immediately cease using the software and remove the software from your machine," the copy continued [emphasis added]. The abbreviated license's intention was similar to that of the end-user license agreement (EULA) tied to the production version. "Updating or upgrading from non-Genuine software with software from Microsoft or authorized sources does not make your original version or the updated/upgraded version Genuine, and in that situation, you do not have a license to use the software," that EULA read. In Computerworld's case, the new watermark and license text appeared on build 10525 after Windows 10 was updated Tuesday from build 10240. That copy of Windows 10 was originally installed on a virtual machine from a disk image -- or .iso file -- downloaded from Microsoft's website. The virtual machine had been newly created, and the Insider preview had been installed from scratch: In other words, it was not backed by a valid Windows 7 or 8.1 license from which an upgrade was authorized. In fact, the practice had been the focus of considerable interest in June, when Microsoft took several tries to explain who of those on the preview program could continue to run Windows 10 after its July 29 launch. The final word? "Let me start by restating very clearly that Windows 10, whether you get it on 7/29 or whether you got it in a preview form through the Windows Insider Program, is intended to be installed on [a] Genuine Windows device," said Gabriel Aul, engineering general manager for Microsoft's operating system, in a June 22 blog. "Genuine" is Microsoft-speak for a legitimate, activated copy of its software. "This is not a path to attain a license for Windows XP or Windows Vista systems. If your system upgraded from a Genuine Windows 7 or Windows 8.1 license, it will remain activated, but if not, you will be required to roll back to your previous OS version or acquire a new Windows 10 license. If you do not roll back or acquire a new license the build will eventually expire," Aul added. In comments on Twitter around the same time, Aul spelled out what appeared to be a loophole, tweeting assurances that as long as testers continued to run a pre-release build linked to their Microsoft Account -- no matter how it was installed -- Windows 10 would remain activated. "This is pre-release software and is activated with a pre-release key," Aul said of the Insider previews. "Each individual build will expire after a time, but you'll continue to receive new builds, so by the time an older pre-release build expires you'll have received a new one." Computerworld's copy of build 10525 remained activated, presumably by the kind of pre-release product activation key code Aul referenced. However, activation does not legality dispense, even if there may not be a way for Microsoft to easily stop users from running an Insiders preview sans an underlying valid license. Nor may it want to: Insiders is an important part of both Microsoft's feedback loop and its external testing regimen. Once Microsoft completes an update internally, it will be seeded to Insiders, and Insiders only, who will run it for at least a month. At the end of that month, Microsoft will decide if the update is suitably stable -- and that bugs uncovered by participants have been patched -- for the much larger number of consumers tapped into the "Current Branch" distribution track. Microsoft has warned users that they must stop running Windows 10's Insider preview if they didn't upgrade from a valid license of Windows 7 or 8.1, or moved to the beta test program from a legit license obtained from Microsoft or an OEM.